In 1.4.0 StealTools added a new optimize API which aims to replace stealTools.build as the default way of creating a build of a module and all of its dependencies; builds created by stealTools.optimize are smaller and load faster. 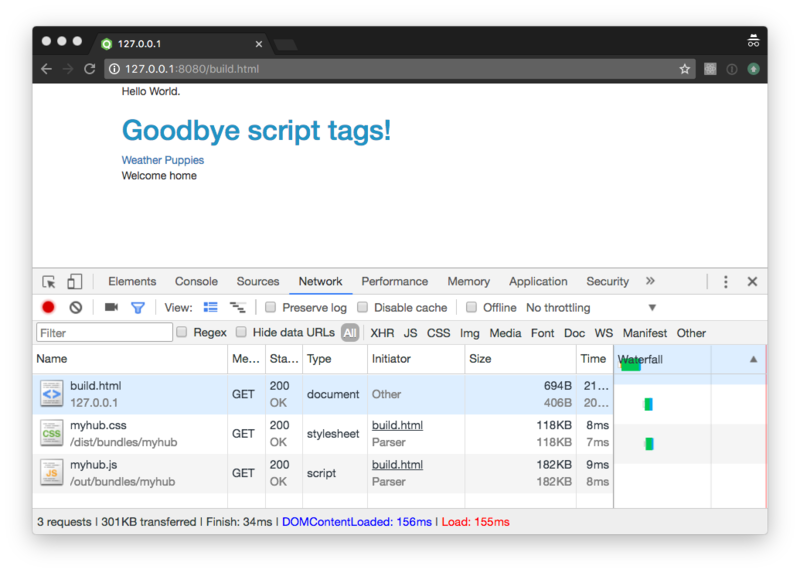 Unlike regular builds, optimized builds don't need to load or bundle StealJS at all; a thin wrapper is added instead to the main bundle so the browser can load and execute the modules correctly. The optimize API is a work in progress, some StealJS features are not supported yet. In this guide, we'll go through the steps required to create and use an optimized build. We'll be using the myhub application created in the Progressive Loading guide. Install Chocolatey, Python, Windows SDK, and Visual Studio as described here. As mentioned before, the optimize API is still in its early days, for that reason we need to use some pre-release packages. Run npm install to install all the application dependencies. The steal-tools optimize CLI can be used instead of NPM scripts. 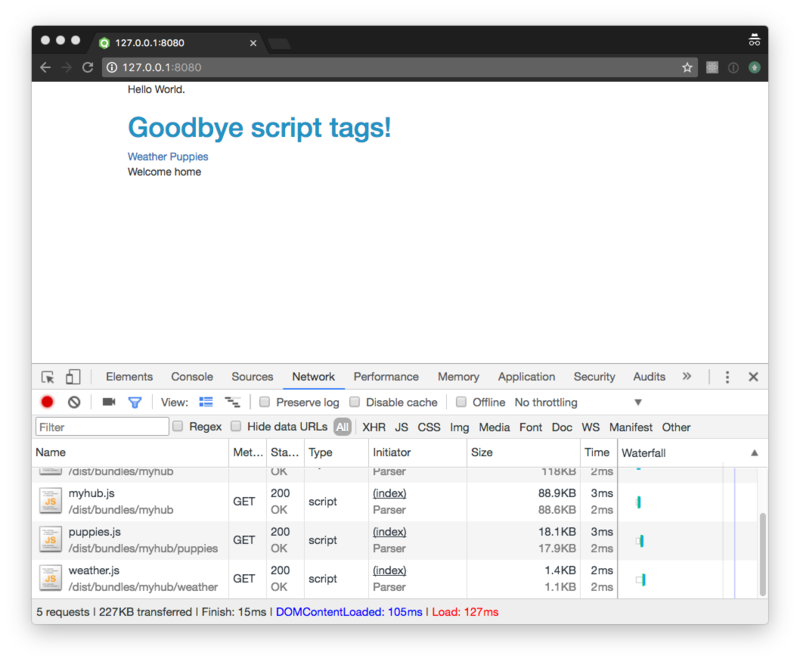 Now, start an http server by running npm start and open http://127.0.0.1:8080/ in a web browser. You should see myhub's home page. One limitation of the optimized loader is that unlike StealJS' loader it does not normalize module identifiers on runtime. For static imports that's not a problem, but it's an issue for dynamic imports (through steal.import), the module identifier needs to match the name set in bundle. For most application builds where StealJS is not included in each of the main bundles, optimized builds will have one fewer http request on the initial load which is already a win. In this example, we are comparing how fast the load event is fired (this event is fired when a resource and its dependent resources have finished loading) when creating the build using stealTools.build (with bundleSteal set to true) and stealTools.optimize. In the screenshot above, the build created by stealTools.build takes 157ms to fire the load event, in contrast the optimized build takes 119ms (24% faster) to fire the load event, see the screenshot below. It's also worth noting that the optimized bundles are smaller; the gzip size of the optimized main bundle is 31.8 kB compared to the 59.5 kB bundle of the regular build (46% smaller!). 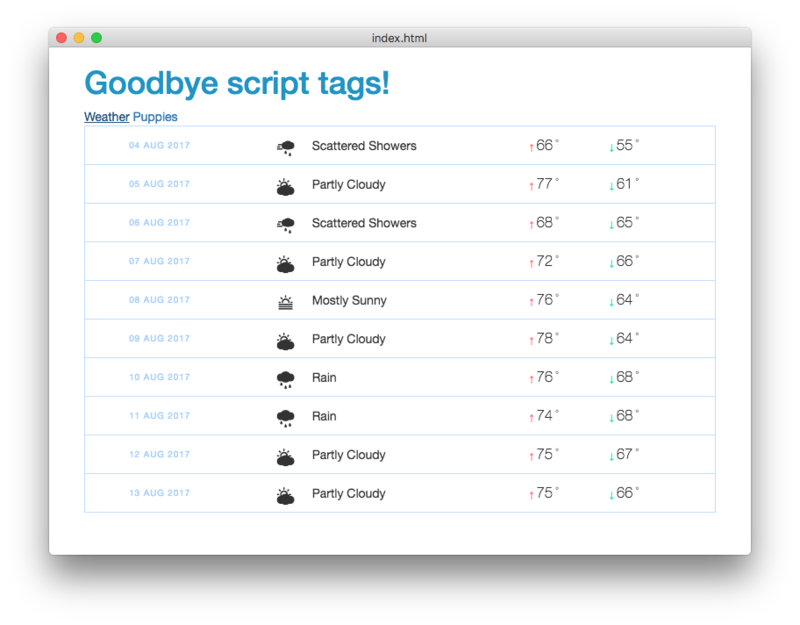 So far we have only loaded the main module of the myhub application; one of the features of this application is that it progressively loads the modules needed to render the weather page and the puppies page only when the user navigates to any of these pages. Once again, the optimized bundle is smaller than the regular one (although the difference is less that 1 kB); but unlike regular bundles loaded with StealJS, the optimized loader can handle bundles loaded using script tags; which means we can take advantage of the browser capability to download the bundle and parse its code without blocking the main thread and without waiting for the user to click any of the navigation links. If you reload your browser, you'd notice that there are two extra requests and the load event takes more or less the same time to fire as before. 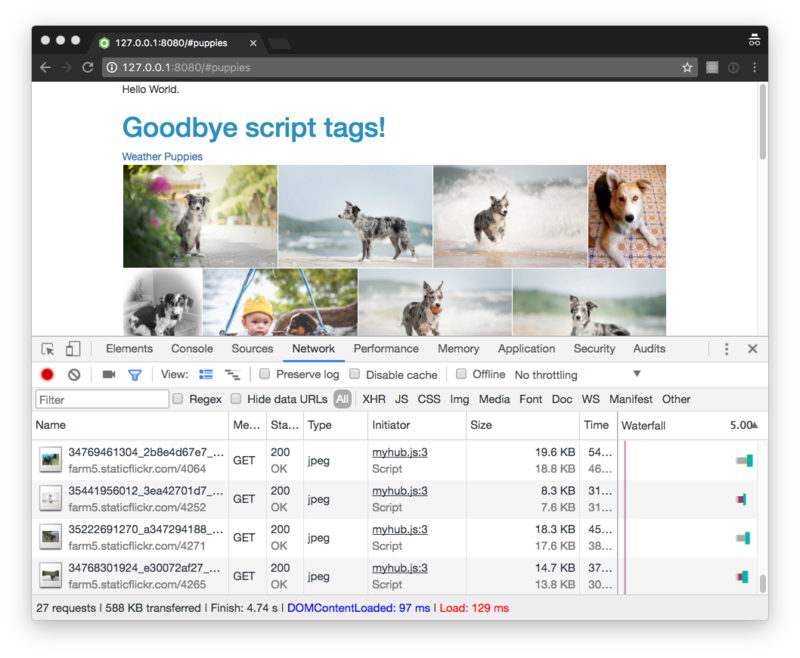 The browser downloaded and parsed the bundles without blocking the main thread, instead of waiting for the user to navigate away from the home page, which results in smoother transitions. 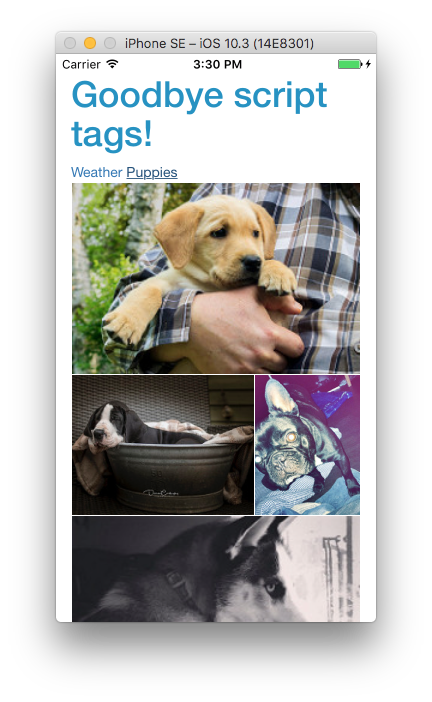 Navigate to the puppies page and see it for yourself! In this part of the guide we will turn the myhub application into an iOS application that can be tested in the iOS simulator using Apache Cordova. This guide is targeted to macOS users, please download and install Xcode from the AppStore before moving forward. Read steal-cordova documentation to get familiar with all the available options. Congrats! you just created an iOS application! If you receive the error "Error: Cannot read property 'replace' of undefined", you can work around it by running cd build/cordova/platforms/ios/cordova/ && npm install ios-sim@6 then cd back into the myhub root folder and run the optimize build script again. The optimize API can be passed a target option to generate code specific to certain platforms, you can read more about it in the steal-tools documentation. The Cordova build requires the web target output to be passed in, first, make sure your target array includes the "web" option. In the last part of this guide we will make a desktop build of our myhub application using Electron. We will need a different entry point for our Electron application, this module will take care of creating windows and handling system events. This code was taken from Electron's quick start guide, read their documentation to get familiar with the available APIs and options. Read steal-electron documentation to get familiar with all the available options. Congrats, you just created a desktop application!